Customers ask for a boxy soft-roader with a storming WRX engine, and the car maker delivers. Subaru has rewarded its third-largest market in the world with a special treat - a hot version of its Forester soft-roader. On the surface it may look like a slightly tweaked version of the Forester XT Turbo, but underneath beats the heart of the WRX, a turbocharged four-cylinder boxer engine developing 193kW of power and 347Nm of torque. There's mild suspension tweaks underneath to reflect the engine's 24kW and 27Nm gain over its more pedestrian sibling, while Subaru Australia managing director Nick Senior says it will cost less than $4000 more than the range-topping XT Turbo Premium, despite a high level of standard equipment. 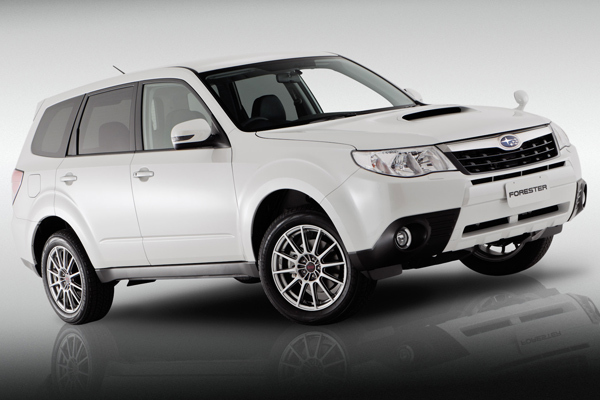 That means the Forester S will sell for a snip under $50,000 when it arrives in Australian showrooms later this year. Senior says the hi-po Forester - today's international reveal takes place a month before it even gets into Japanese showrooms - is a present from Japan. "I guess you could call it a present," he says. "Australia is the third-largest market in the world for Subaru, and this market is a strong one for Forester," he says. The new performance hero for the boxy soft-roader includes exterior details around the grille and wing mirrors, as well as a set of steel roof rails (missing from this production model). Add to that a sunroof, satellite navigation system and dual-zone air conditioning, and Senior says Subaru now has a Forester that customers have been asking for. He expects up to 100 customers a month to back that up with a purchase. He says Subaru would not be able to pull off another world first reveal for Melbourne's version of the show, but the car maker would definitely have something locally significant. "It won't be a world first, but it will definitely be something exciting,"
Oh, and don't worry about that daggy looking wing mirror hanging off the left-hand guard. Senior says this particular model is a Japanese specification Forester, and the Australian version will not have it. So, if like the Forester, enough customers ask for a vehicle, will Subaru bring back the Brumby ute? "No," is the curt response. The show opens today at 5pm and runs until October 24, 2010.